The London College of Music contacted me a few months ago to ask my permission to use a piece of music that I composed in 2014 titled ‘The Great War Ghost Waltz’. 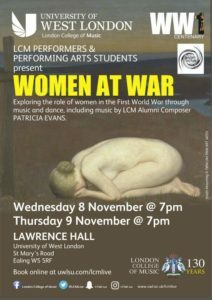 They were looking for a modern day score to accompany a production titled ‘Women at War’ – a performance that explores the role of women during the first World War through music and dance. Three months later, here I am, sat in the Lawrence Hall at the London College of Music watching sixty performing arts students at their the dress rehearsal ahead of the first evening performance. I have been invited down to London as a guest for the day. It has been a pretty surreal experience witnessing one of my compositions become the consistent musical theme that weaves its way throughout this production. Todays experience has led me to reflect on the journey that this piece of music has taken from my front room. I wrote it on the 100 year anniversary of the start of the Great War. Like everything I write, I’m not really sure why I did so or where it came from. Music seems to just jump out of the cosmos and make its way through me if I am in the right mood. I sometimes wonder if music and songs are created elsewhere and are looking for portholes on planet Earth to manifest themselves. I wrote this piece of music on the piano whilst thinking about the war. It is sombre and simple and in ¾ time, making it a waltz (1-2-3, 1-2-3). I asked my friend Bethany Porter to record some cello to it and also recorded a 15 piece male voice choir humming like ghosts in the background. I selected some poignant photographic images and set them to the music before uploading it to You Tube. The wonderful power of the internet then fired this music out into the world. I have since been asked on several occasions if people or organisations could use the music for various war related purposes and performances. Watching a live, powerful and pretty dark production whilst hearing an accomplished musical director perform my piece on the piano has been quite moving. I guess the surreal element to the day is how this piece of music has jumped from my front room to a stage in London. It is a simple piano waltz that takes on a whole new depth of character when used to help depict the impact of war on women. 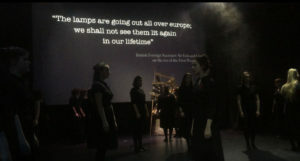 It feels so right that the pain suffered 100 years ago is today, shared by performing arts students to portray history. It is through art that stories are told, made accessible and kept alive. I feel honoured that my music has resonated with the team who created this production and would like to thank Emma Evans (London College of Music) and Bryony Williams (SpiralArts) for inviting me over for the day. Below is the original video and composition featuring Bethany Porter on cello and 15 piece male voice choir. I was one of those who asked for permission to use this piece of music in 2014 and I have again used it a second time on the 11th November 2018 as we remembered the ending of the war. It was played as the names of those from our parish who were killed scrolled up on a screen. It is so haunting and was the most appropriate piece of music that I found for our service in 2014. My thanks again for your permission to play it.